220V/6KW Commercial Electric Baking Oven Professional Pizza Cake Bread Oven. (This item is 220V, do not support 110V). Specification: Model: ASQ-E22 Voltage: 220V - 240V Power: 6KW Temperature: 0 - 400. Timer: 0 - 60min Inner Each Chamber Size: 650 530 170mm, 2 layers Bakeware Size: 600 400 48mm Machine Size: 920 700 720mm Weight: 70kg. Features: Stainless Steel finishing With glass window, Internal light for easy monitoring Two layers, each cooking chamber having independent temperature controls Top & bottom heating make it a good cooking environment. 400 high temperature roast, temperature control from 0-400 Timer roast, Timing control for 0 - 60 minutes Digital display temperature. 1 x Double Layer Electric Baking Oven. The items will be sent to a confirmed address Please make sure your address is correct, and your city name matches your post code. We will work with you to solve any problems. 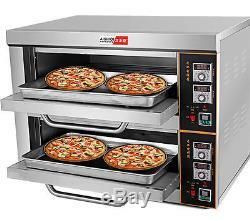 The item "220V/6KW Commercial Electric Baking Oven Professional Pizza Cake Bread Oven" is in sale since Thursday, April 27, 2017. This item is in the category "Business & Industrial\Restaurant & Catering\Commercial Kitchen Equipment\Cooking & Warming Equipment\Ovens & Ranges\Pizza Ovens". The seller is "ho-shine" and is located in cn,cn. This item can be shipped worldwide.